Images – Page 2 – It's Hamiltime! If you’ve visited Central Park, you may have come across a very handsome statue of Alexander Hamilton. The statue is located between 82nd and 83rd streets on the East Side of the park. 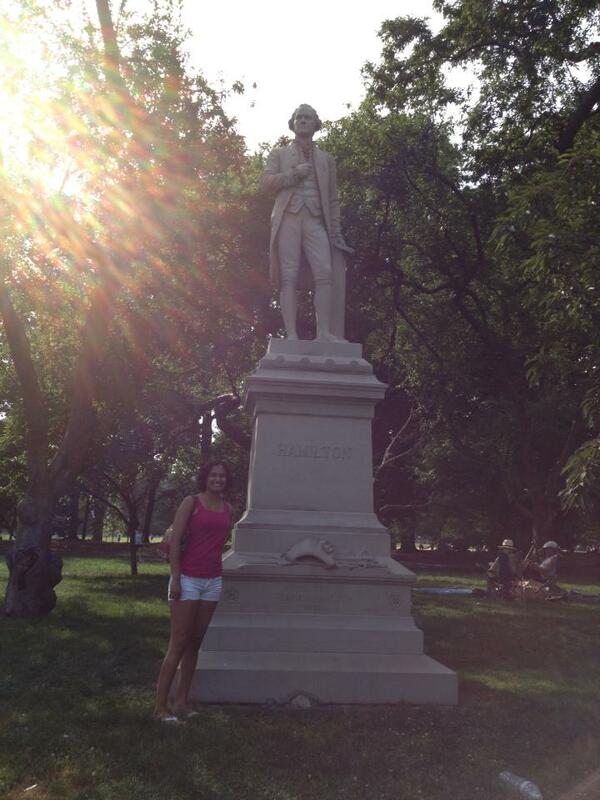 The statue was donated by Hamilton’s son, John C. Hamilton to the park in 1880. The Hamilton statue was sculpted by Carl H. Conrads, an American sculptor best known for his work commemorating the Civil War. Conrads served in the Union Army during the Civil War and designed statues that you can find in West Point and San Francisco. The original statue is pictured here, in an image from the New York Public Library. For the full text of Depew’s remarks, see here. Earlier, I wrote a post about John Trumbull’s images of Hamilton . Today, we got some exciting news about one of Trumbull’s most iconic Hamilton portraits! Credit Suisse, the owner of the portrait, announced that it will be gifted to two institutions: Crystal Bridges Museum of American Art in Arkansas and the Metropolitan Museum of Art in New York City. This split ownership arrangement will allow the painting to be seen by audiences in two very different parts of the country. Credit Suisse had put the painting on view at public institutions for short periods of time, but it decided that the painting should be permanently accessible to the public. The painting was acquired by Credit Suisse as part of its takeover of another investment bank, DLJ. The painting had been part of DLJ’s corporate art collection. The painting’s history is very much a New York story. In 1791 five New York merchants representing the Chamber of Commerce commissioned Trumbull to paint a full-length portrait of Hamilton, President Washington’s secretary of the Treasury. For Trumbull the assignment was trickier than it seemed. 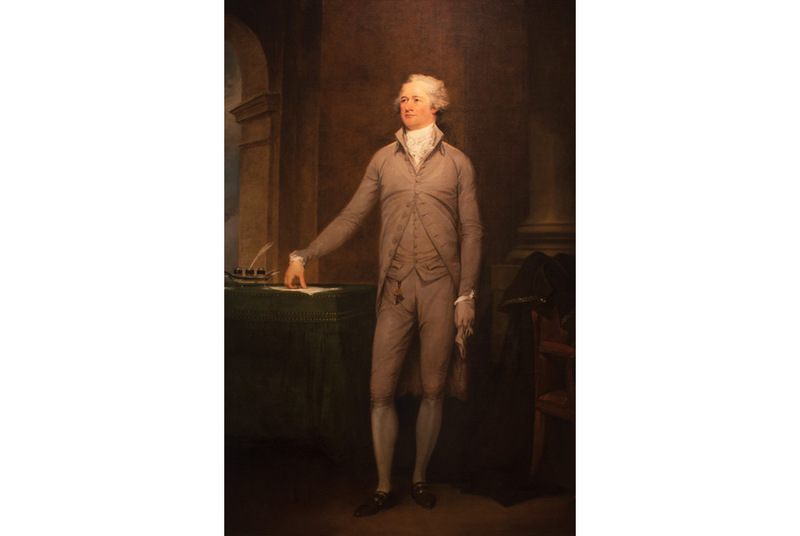 He and his subject were friends, and Hamilton was vocal in wishing his portrait to appear “unconnected with any incident of my political life.” But the men who commissioned the painting wanted it to hang in a public building. How then could Trumbull please his clients, who said they envisioned a work stately enough to be on public view, and the sitter, who shunned anything remotely official? 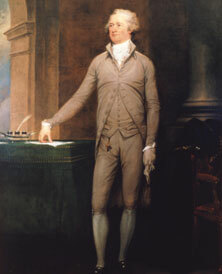 Taking his inspiration from European Grand Manner portraiture, the artist posed Hamilton standing, one hand on a table that is empty except for an ink stand and papers, devoid of any political references. In the background is an archway on one side and an architectural column on the other, along with a chair with a robe causally thrown over it. Check out these super creative renditions of currency with inspiration drawn from the worlds of film, art, and popular culture. These images were created by artists Akira Beard and James Charles as part of a 2011 show at the Shooting Gallery in San Francisco entitled: American Iconomics. Some of these awesome pieces are still on sale, for $600 a piece. You should check out the full collection of images here– you’ll find Andrew Jackson as Ronald McDonald, Ulysses S. Grant as Mr. T, and other awesome iconic images. Here are my favorite Hamilton images from the show. Note: all images were taken from the Shooting Gallery American Iconomics site. Writing this from the clouds: in an airplane flying from DC to LA! I love technology! 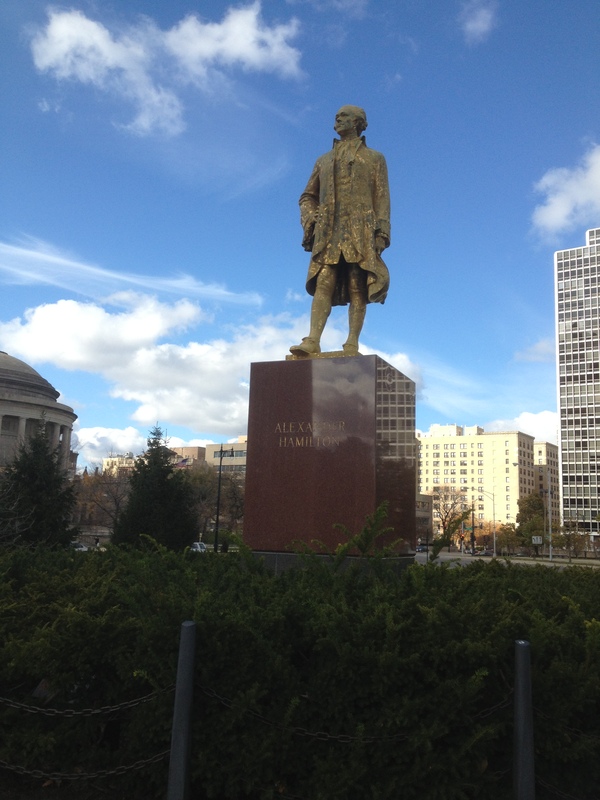 If you’ve explored DC, you may have noticed that Hamilton is conspicuously absent in terms of memorials, statues, and public art from the city he had a huge role in making the capital. While Jefferson’s influence can be felt throughout the city, Hamilton has been relegated to a much smaller role. However, if you are looking for Hamilton stuff in DC- check out these places. If you’re in the Rotunda, you’ll notice this statue. It was made by Horatio Stone, a prominent sculptor/doctor in the mid-1800s whose sculptures can be seen throughout Washington. And, I’ve resolved that I’ll finally eat here next time I’m in DC! The Hamilton is a restaurant/music venue located near Metro Center. And, according to the Washington Post, the food’s pretty good. Gotta love Hamilton in his own Hamil-swag. The Sierra Star recently published a piece on John Trumbull entitled “A Revolutionary Painter.” Trumbull was an active participant in the revolution, and a military comrade of Hamilton. He briefly served as an aide to Washington, and was involved in politics as he pursued his artistic career. Trumbull produced some of the most iconic images of the Revolution and the Early Republic. Trumbull painted several pictures of Hamilton, and featured him prominently in his group paintings of the Constitutional Convention and the Revolutionary War. Trumbull had planned to pursue his career in Boston, but found that the market for his services was too crowded by other artists. He instead returned to New York, and was commissioned by the city government to paint whole length portraits of Jay and Hamilton. Trumbull states that he created the portrait using the bust created by Ceracchi (and later bought by Jefferson to display in Monticello) as inspiration for those portraits. This was painted in 1805, the year after Hamilton’s death, and Trumbull used various accumulated drawings as its basis. This portrait is the basis for the design of the Ten Dollar bill. This 1832 portrait was copied from an original that Trumbull had painted in Washington in 1792. Trumbull is an interesting historical figure in his own right. If you’re interested in reading more about him, I suggest looking at his Autobiography or John Trumbull : a brief sketch of his life, to which is added a catalogue of his works (1901) by John Ferguson Weir.